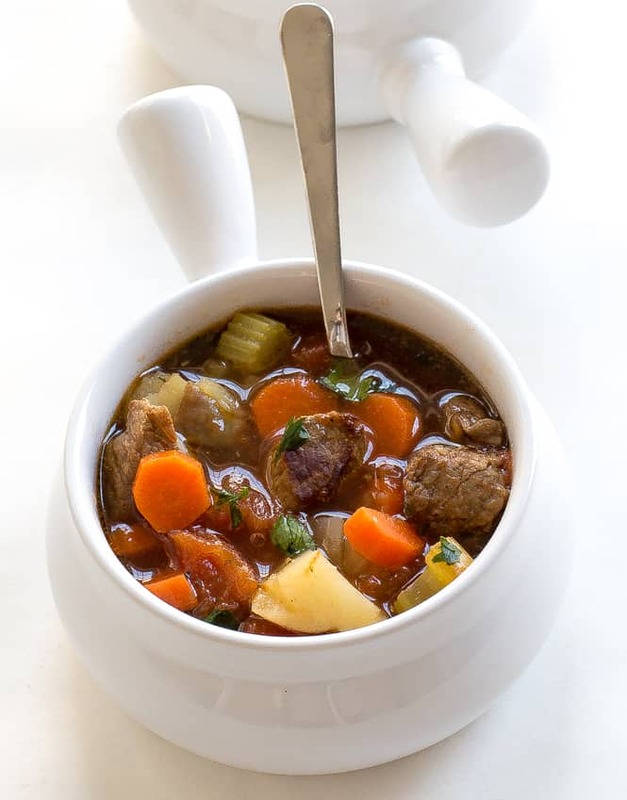 Vegetable Beef Soup. Super comforting, hearty and can be ready in less than 45 minutes! Hi guys! It’s Kelley back from Chef Savvy! 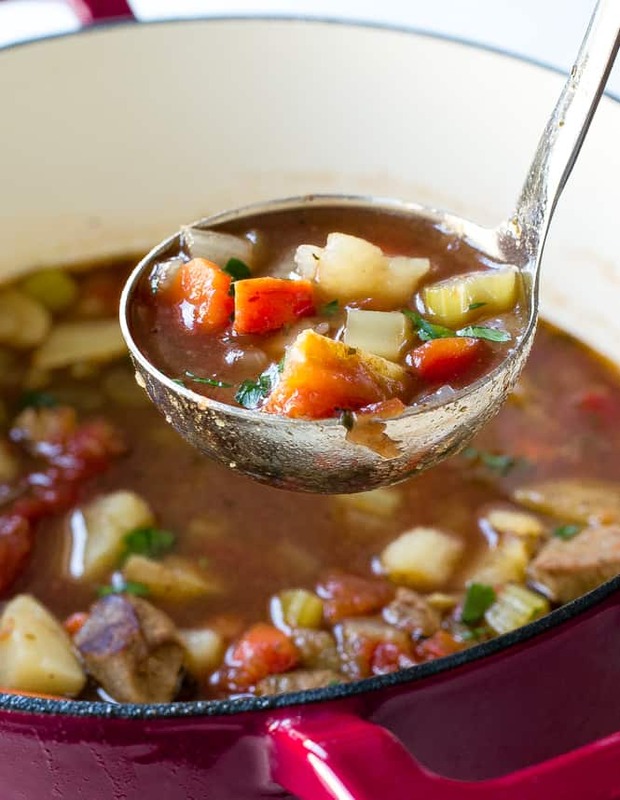 Today I am sharing this warm and hearty Vegetable Beef Soup! There is nothing more that I love than soup when it’s cold outside. We have been getting alot of rain and colder temps in the Northeast and this is the perfect soup for a day like today! This soup is packed with vegetables, tomatoes, and beef. The beef gets super tender as it cooks in the soup and adds lots of flavor to the broth. I love how easy this soup can be thrown together. Simply brown the meat and sauté the veggies. Stir in broth, crushed tomatoes and seasoning. Simmer for 25-30 minutes. Serve with warm crusty bread, fresh parsley and parmesan cheese! This soup also serves about 6-8 which means tons of leftovers! Enjoy! Add in the steak in batches making sure not to over crowd the pan. (I did two batches). Cook until browned on both sides, about 2-3 minutes. Add in the onion, garlic, carrots, celery and potatoes. Saute for 3-4 minutes stirring occasionally. Add the remaining ingredients as well as the steak. Bring to a boil and simmer for 25-30 minute. Season with salt and pepper to taste and serve with fresh parsley, cheese and crushed red pepper flakes if desired. 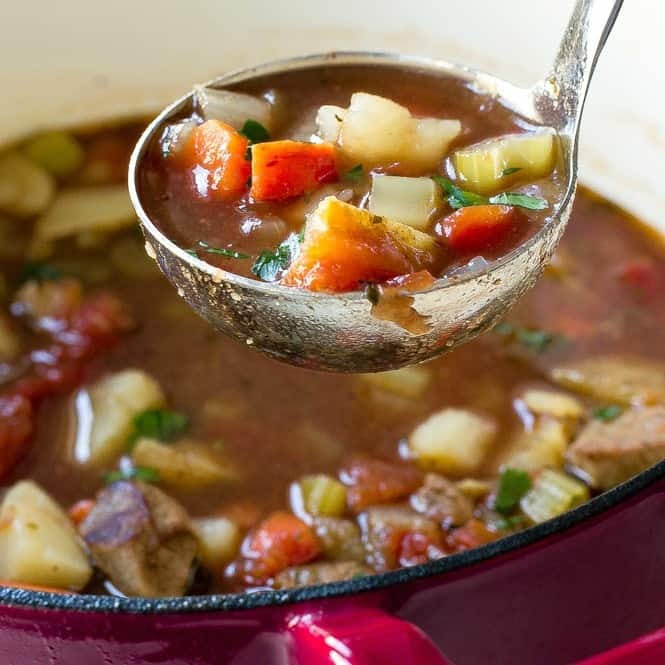 Love this Vegetable Beef Soup? 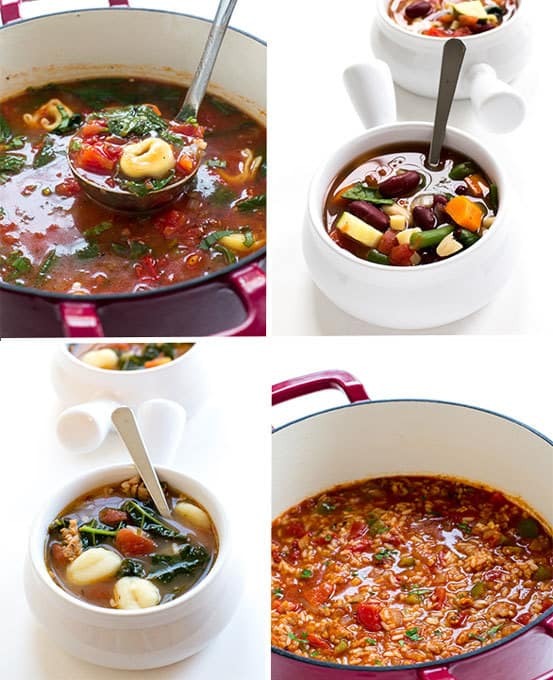 Here are some more Soup Recipes to try! Could you add a small pasta to this? This soup was absolutely delicious. We added two tablespoons of tomato paste, and a can of black beans to thicken the broth a little add a little more to the vegetables. 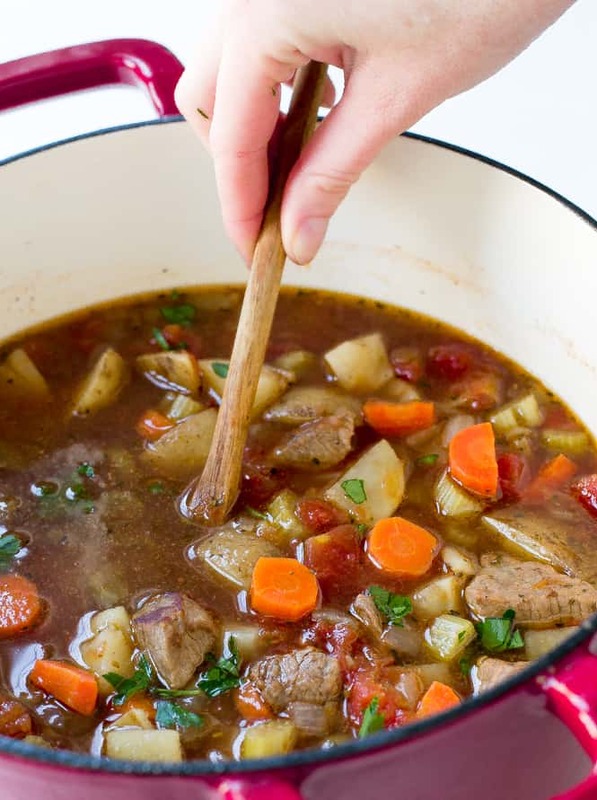 This will be my go-to beef soup recipe for sure! I’m so glad I found this site not only for the vegetable beef soup that was phenomenal- but for a bunch of unique dinner ideas too! Thank you! Added green beans, corn, and one tiny can of tomato paste to the recipe. Wonderful great tasting soup on a cold day with a grilled cheese sandwich. Making this right now and plan to add some cabbage to the vegetables. Hope it won’t thicken the soup too much. Don’t want it to be like stew. Does the beef get tender in such a short period of time? I read this recipe and I’ll assume God had me search to find it. My volunteer job with our church gives me opportunities to prepare meals every Wednesday for up to 100 folks. Then once a month we have a soup and sandwich meal after church on sunday for twenty to thirty more. I am the one that chooses the meals, buys the food etc. When I saw this recipe it will be added to our list. Sounds delicious! Hey, When I found this recipe my first thought was how easy and simple! Then, since I head up the food ministries at our church, the decision to modify it to feed about 100 seemed like a revelation. So tomorrow at our church here in NC the crowd will have their chance to try it. The team and I will make some vegetable soup also. Served with it will be Italian bread crusteenies, garlic or plain. Amazing! I used ground hamburger instead and added one half cup of roasted garlic classico pasta sauce. Only things I added were cayenne pepper, and I used ground beef! Was delicious! Thank you for sharing this wonderful recipe. Can you add noodles or rice to vegetable beef soup? I made broth from prime rib leftover and added all vegetables except potatoes. Cause I was going to add noodles or rice. What do you think? This was delicious. Most of my soup attempts are tasteless, htis was superb. I used ditalinni pasta instead of potatoes. Is there nutrition info for this recipe? I like to use myfitnesspal.com or skinnytaste.com for any nutritional information. Hope that helps answer your questions. Kelly, this sounds too good, on my way to the grocery store. This is so yummy!! I added cabbage, corn, green beans and tomato paste. It was perfect with the left over shredded pot roast we had. I didn’t have to prep more meat! Yes! Cooking for the same amount of time. I am so glad that you and your wife loved it. I love that you enjoyed it so much. Thanks for following along with me! Only used 1 small potato to make it lower carb for a diabetic family member. Bumped up the carrots and celery to 1 cup each and added 1 cup cut green beans to keep the veggie proportions about the same. Very tasty soup and so easy to make. Served it with homemade almond flour crackers (low carb) and cheese. Very nice. This is a solid and very very delicious base recipe. The first time I made this, I needed to use some meat that was going to expire and substituted ground sausage and corn, for the steak and potatoes. Just the stuff I had in the house. Now I am at the grocery store buying ingredients to make this for the 3rd time because my family loves it. Any other changes I made are just small and done by feel.